Then I realized I had the ability to check this using data, much the same way I determined which Tournament of Champions entrants were best at seeking out Daily Doubles. 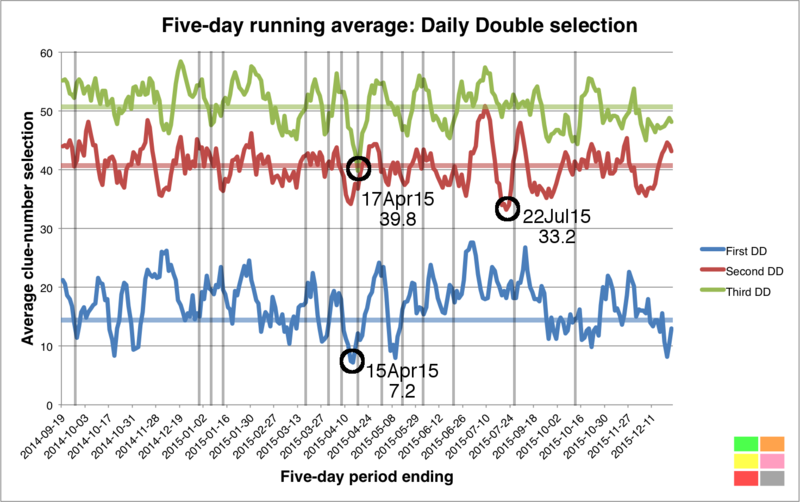 Turns out my hunch was somewhat wrong: as of the 5- and 10-day periods ending December 23, the players were well below the average on the first and third Daily Doubles. Here are the running averages from the beginning of Season 31. The drops from Alex Jacob, who lost April 20, are fairly obvious, but I was fairly surprised to see games with Scott Lord (lost July 27) had the lowest average of finding the second Daily Double. Each vertical line represents the end of a ToCer’s run. Odd to me is Matt Jackson (lost October 14); he has a precipitous drop in both the first and third, while second slowly rises. Maybe that’s because his opponents refused to bounce with him, and they took off more top-row clues before getting to the DDs. In any event, these data seem to support the idea that the biggest advantage goes to players who (1) seek out the Daily Doubles and (2) perhaps more importantly, have the knowledge base to back them up. Players who do the first without the second often self-destruct. That’s not to say, of course, that a player with a broad range of knowledge can’t do really well without hunting for Daily Doubles – Julia Collins and Ben Ingram come to mind, and several ToCers this season (including finalist Kerry Greene) did not miss the average by all that much. A couple of notes: if players did not find a Daily Double, I considered that to have been found on clue 30 or 60, as appropriate; the first clue selected in the Double Jeopardy! round counted as clue 31, regardless of number of clues revealed in the first round. Considering the advantage (in terms of Final Jeopardy positioning) that a Penultimate Wager or Antepenultimate Wager provides, do you think it is worth the risk to try to leave a Daily Double until late for that reason? 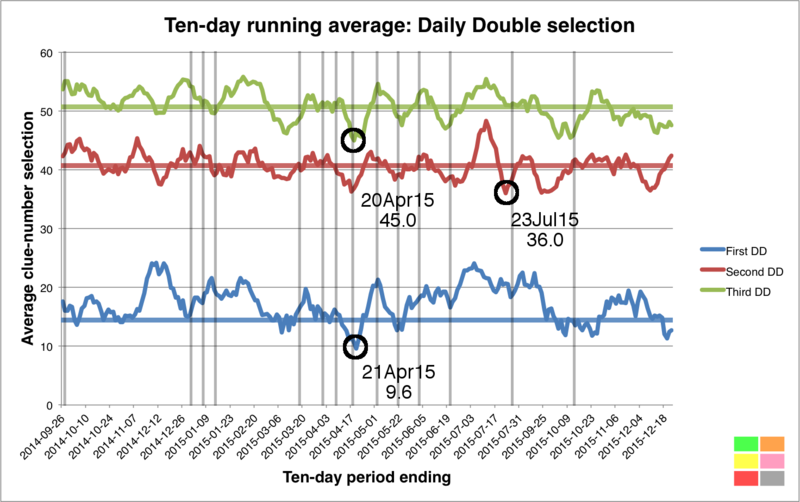 Or do you think it is still better to get the Daily Doubles out of the way early? Hmm… maybe if you have a way to guarantee you’ll be the one who finds it, and that no one else stumbles across it in the meantime.